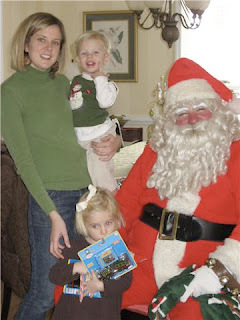 On Sunday morning we got a surprise visit from Santa! 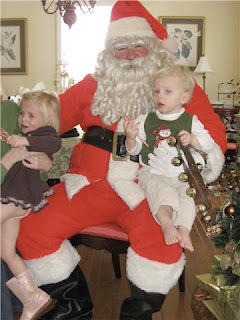 He came to Nena and Poppy's house to make sure Caroline and Tucker were on the nice list and not on the naughty list. Tucker was in awe, but Caroline was not impressed. She wanted nothing to do with Santa. Tucker sat on his lap without hesitation and was very excited to see that Santa has candy canes! 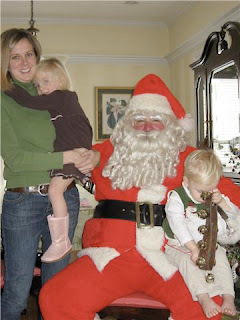 Finally, Caroline warmed up to Santa, but only after he gave them gifts. They each got a Thomas the Train engine. 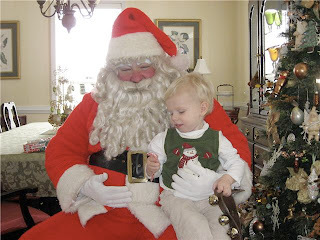 Santa reminded them to be good and perhaps he might just have a pink princess dress and motorcycle to leave under the tree at Brown House (aka our house in Sewanee). 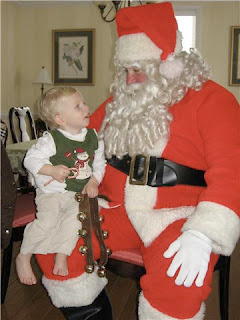 After Santa left I asked Caroline why she was afraid of him and wouldn't sit on his lap. She told me that "he was too big."